At my stamp camp class earlier this month, I made this card while I was demonstrating the Big Shot Letterpress plates. So much fun!! I'm totally addicted and want to make more now. Through trail and error, I found that you get the best impression on the Watercolor Paper. Funny. Isn't that what the instructions say?! 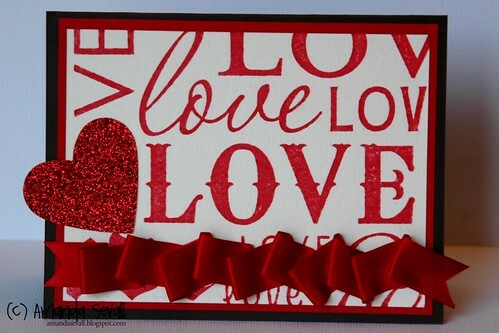 aww this is great love the bit of sparkle and really love your ribbon! Now following from sc! stop on over and visit me :D hugz n blessings. Amanda what a great card. Welcome to the SC list. It's a long but fabulous list, with lots of great blogs and friends along the way who both inspire and support us. I'm #212 on the list so if you get a chance pop on by and say hello. You did such a great job with this letterpress plate. I didn't have much success...guess I need to try again!! #271 following from Stampin Connection. Super card! I love the letterpress too! I like your blog, especially the owl. Very nice. Following Through SC. TFS and God Bless. Found you through Stampin' Connection. Love the letterpress. Love this card! I need to break down and get watercolor paper to do this with. Not loving using regular cardstock with it. I, too, LOVE that glitter paper!! You did a much better job than I did with that silly letterpress! Your card looks great! I'm your newest follower from SC! (I'm #1 on List A) Stop on by some time! Very pretty card. Great ribbon treatment. I'm a new follower from Stampin' Connection (#247 on list). Come by my blog for a visit. I'm following you from stampin connection. I'm #188 on the list as www.bzstampr.blogspot.com. I'm now following you from Stampin' Connection. I'm #302. Awww... beautiful. Following from SC #334. Thank you for inviting us into your blogging life. Lastly LOVE your blog header!!!!!!!!!!!!!!!!!! Oh my goodness that's gorgeous Amanda! I love how the letterpress part came out.